You are here: Home / About Us / Library Staff / Marcellus Library staff members provide valuable skills and services. Marcellus Library staff members provide valuable skills and services. In 1895, when the Ladies’ Library was formed in Marcellus, the volunteers who organized and managed the library were literate and able to keep track of books that were donated, loaned out and returned. Today’s Marcellus Library staff have more detailed job descriptions. Libraries are no longer places just for borrowing books. They have expanded to include resource material, historical documents, movies, books on tape, electronic resources and a myriad of services to the community. Patrons now come to the library to use a computer or their own device, to print out material, to make copies, send faxes, work on their tax forms and search or apply for jobs. Library staff persons now need to be able to do more than check books out and in, though that is at the core of the library’s purpose. Over the years, the development of a multi-trained staff has become increasingly important, in order to maintain a large collection of materials, provide services, develop programming and stay up to date on changing electronic operations and options. The Marcellus Library staff now includes a team of six people who come with various backgrounds and who continually develop new skills in order to respond in a friendly, professional way to patrons’ questions and needs. Christine Nofsinger, Library Director, has worked with the Library Board for many years to create a well-resourced library and a competent staff. It is important to have a variety of skills and personalities so that the library is both useful and welcoming. All library staff learn to relate to patrons and to handle all tasks needed for the library’s main purpose and services. Each staff person also has specific tasks related to their skills and training. Jo Beachy has been working at the library since October 2010. She works at the library during the winter months and is an organic vegetable and flower grower in the summer. Jo’s primary task is to manage the Inter-Library Loan system, which permits patrons from one library to order books from another library in Michigan. She says, “I love that we can get books from any library in Michigan, and people from all over the state can borrow from us!” Jo also checks up on overdue books, creates book displays, and “weeds out” old or unused books to make room for newer ones. Byron Cuddeback began to work at the Marcellus Library in February 2013. Prior to starting at the library, he worked at John Rollins Bookstore for eleven years. Byron’s primary task is to receive and catalogue all new books, movies, and magazines which are received by the library through purchase or donation. This requires research to determine the kind of book it is, the Dewey Decimal System number which must be attached to the book, and then to prepare the book to be shelved and added to the library’s electronic catalogue. Byron also has extensive computer and systems knowledge and is frequently the preferred “go-to” person for challenging searches or computer problems. Assistant program director, Joy Kozik, has been working at the library since May 2015. She and the library director plan programs, invite speakers, and organize special events at the library. Joy, who is a self-taught computer and graphic design artist, creates fliers for program promotion, graphics for special projects, holiday decorations and book or video displays. She works on crafts and activities with the Pre-school Story Hour children and continually generates new ideas for educational and artistic projects. Suzanne Lind has worked on an inventory of the library archives and a series of newspaper articles about Marcellus Library history. She began to work at the library in March 2016 and in 2017 became the Story Hour Lady for the weekly pre-school story hour. Patty Witten began working at the library in 2001, when she was fourteen years old, and continued for eight years as a summer or part-time worker. In mid-2018 she re-joined the library staff. Patty’s expertise is in the area of social media; she manages the library’s presence on the library website, Facebook, twitter, Pinterest and several on-line boards for special projects. Patty is also focusing on creating more teen events and opportunities for teens to enjoy reading and writing. In addition to on-the-job training, library staff attend occasional special trainings. Director Nofsinger recently wrote grant proposals, and was awarded funds that will send her and staff member Joy Kozik to the 2019 Conference of the National Association for Rural and Small Libraries, which will take place in Burlington, Vermont in September 2019. 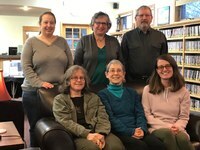 They are sure to return with many new ideas and much encouragement to continue to provide creative library programs and effective service at the Marcellus Library. When asked, “What do you enjoy about working at the library?” all staff members said approximately the same three things: 1. We love to be surrounded by books, to see and hold new books, to talk with patrons about books. 2. We appreciate the pleasant working environment, sharing a variety of tasks, being in a place where ideas are welcome and individual styles are affirmed. 3. We are happy that so many people from the Marcellus community come through the library doors, engaging us in conversation, research, and service provision; sharing interesting news and views with us; and confirming our belief in the importance of libraries.